15 years ago I actually got to say that in Greece. 🙂 I was navigating the drive and trying to give directions but as everything was in the Greek alphabet (go figure, I know) I threw my hands up and said “I don’t know it’s all Greek to me!” Things like that just crack me up. It was an amazing trip and I would love to go back. And of course, the food! So I thought I would do a Greek dinner. I had a bit of lamb shoulder and some gorgeous veg from the garden. 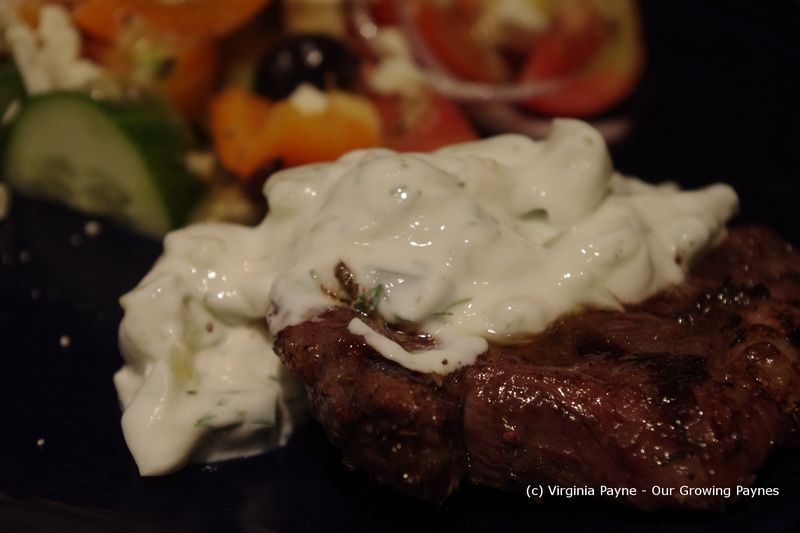 I made a marinated grilled lamb with tzatziki sauce and a Greek salad. A real Greek salad. No lettuce allowed! Not sure how lettuce snuck in over here but the greek salads of my youth, you know the one with the iceberg lettuce, were anemic compared to the ones you get in Greece. 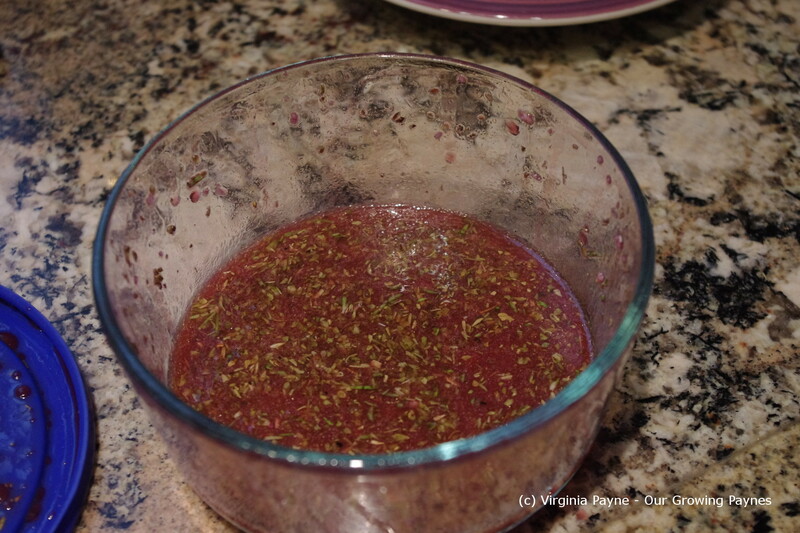 For the lamb marinade I used inspiration from the Barefoot Contessa. However, as her marinade was for 4-6 servings I definitely had to make it my own. To start I was making dinner for two. And as we don’t eat a ton the piece of meat we were sharing was just under 1/2 a pound. 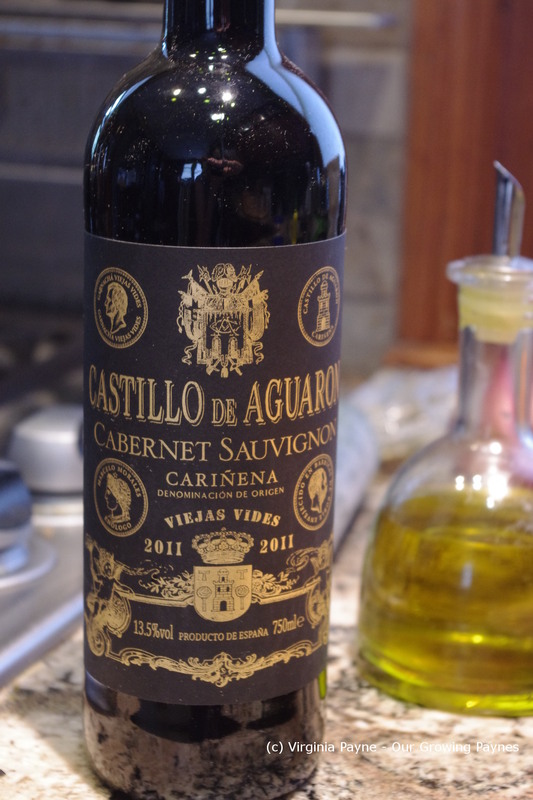 I needed to pick out a good dry red wine for this so I decided to use this wine from Spain. Next in a bowl I added 2 cloves of garlic chopped, a sprig of rosemary chopped, a good sprinkling of dried oregano, just over 1/8 cup lemon juice, 1/4 cup olive oil, and 1/4 cup red wine. Next season the lamb with salt and pepper. Sea salt or Kosher salt is best. Place it in the marinade and set aside. I did this about an hour ahead. 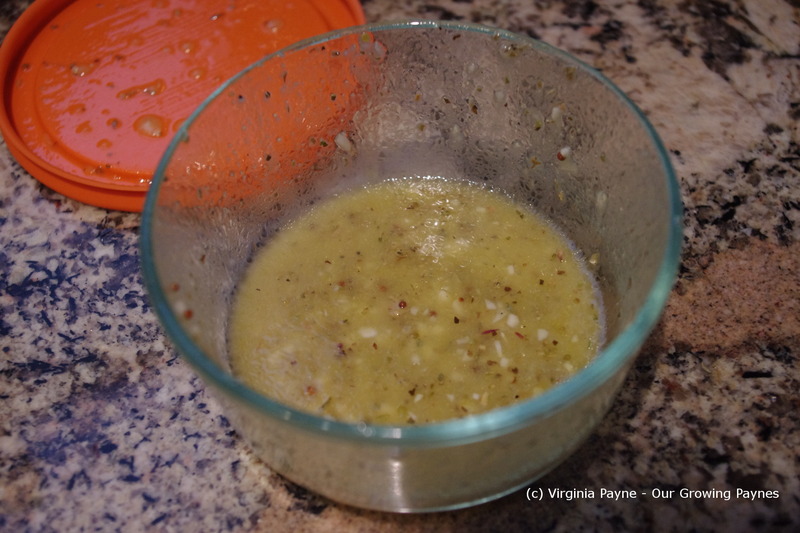 Next I made the dressing as I wanted it to have time for the flavours to meld. Again I used Barefoot Contessa as a guide for this one. 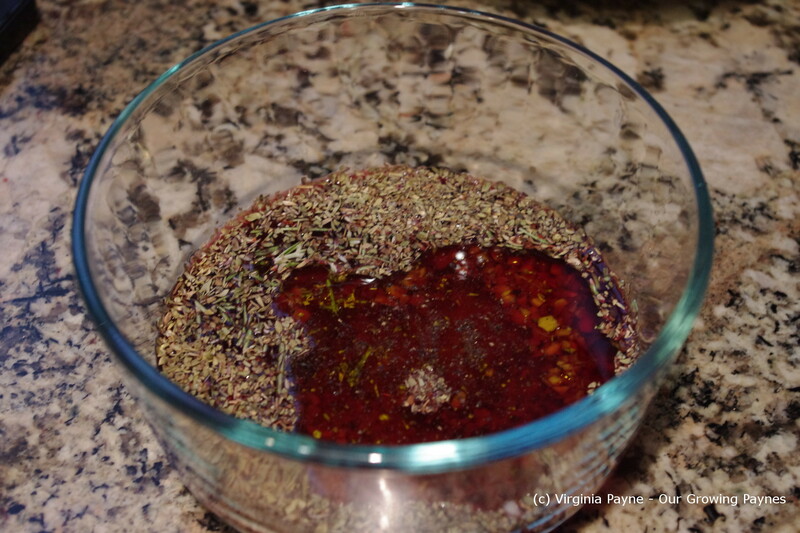 In a small bowl mix 2 cloves chopped garlic, a small spoonful of stone ground mustard, 1/4 cup of red wine vinegar, and some salt and pepper. Whisk it well. 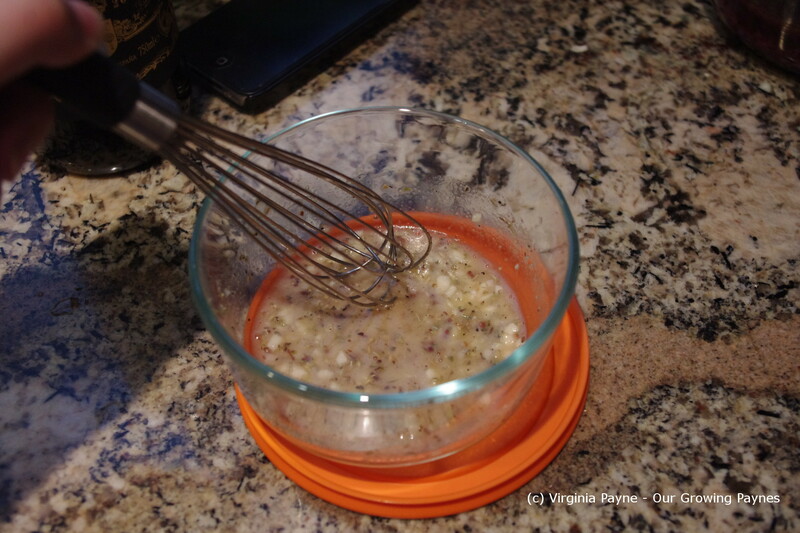 Then while continuing to whisk add olive oil until you have the consistency you want. Set aside in the fridge until it is time to serve. 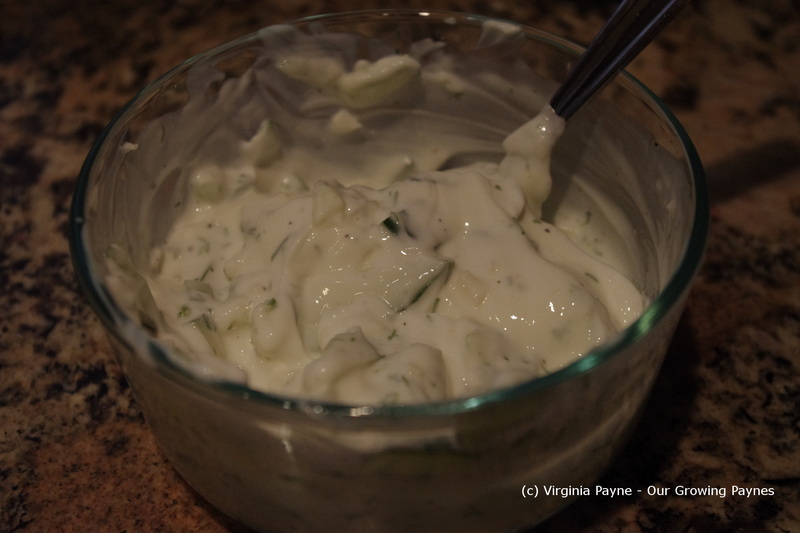 I waited to do the tzatziki sauce until I had the lamb cooking on the grill. 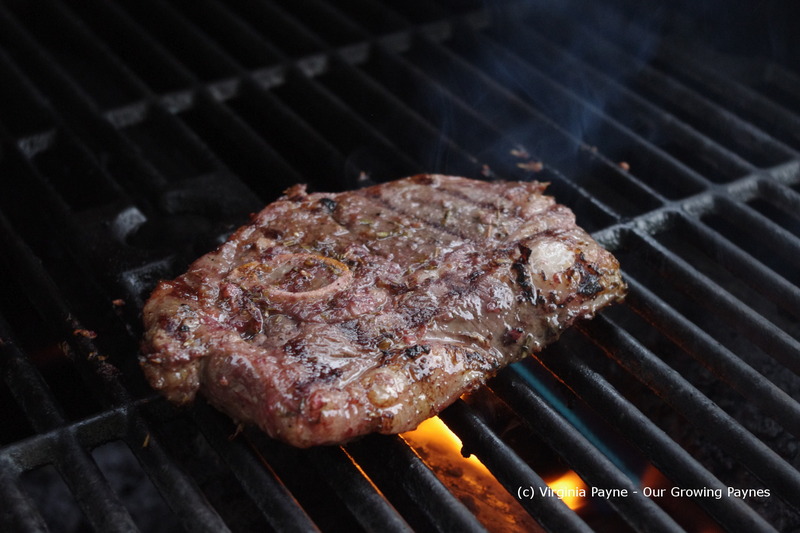 I slow cook the lamb on the grill so it doesn’t come out tough. For the sauce I chopped up a large clove of garlic, no vampires with these dishes, and added it to a bowl with chopped cucumber. I used about a 1/2 cup of cucumber for this. I added a healthy drizzle of olive oil and a few squeezes of lemon juice. 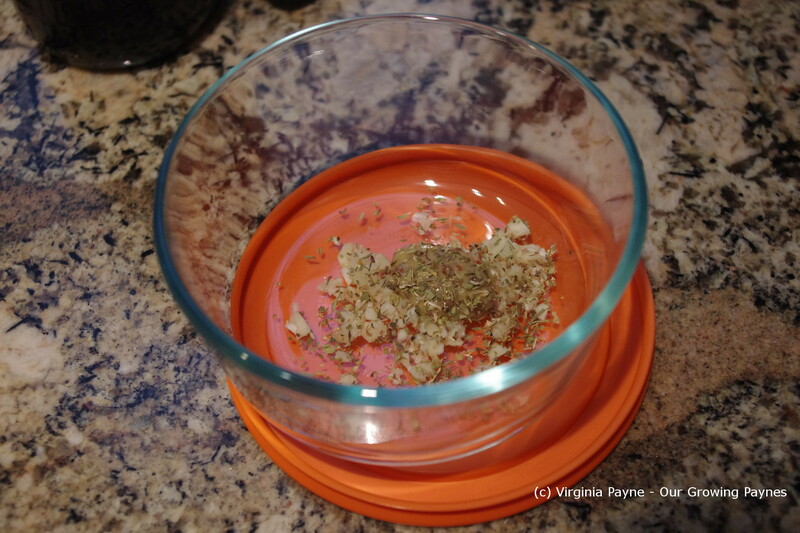 Then I chopped up about a tablespoon of dill and added salt and pepper. To bring it all together I added a cup of Greek Yoghurt. I used fat free for this and it still came out thick and creamy. Now it is always important to clean your recyclables. With yoghurt pots I have a team to help me. 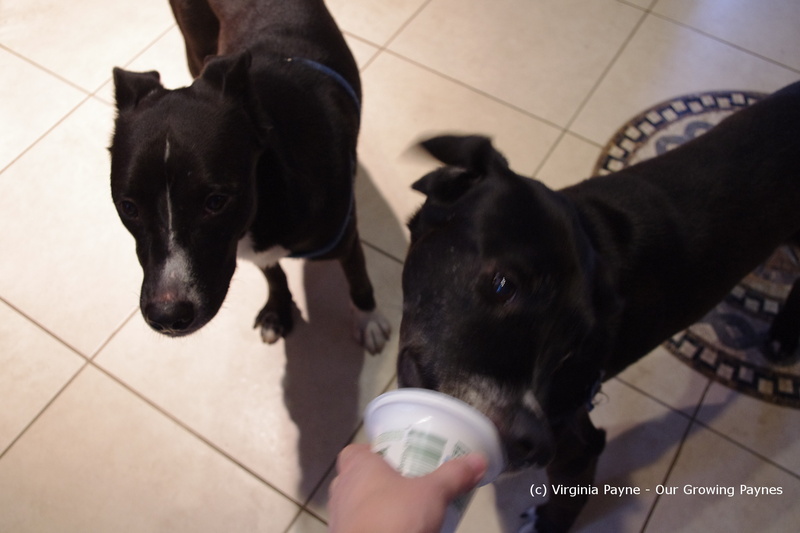 Guinness always gets the pot so poor Murphy has to settle for the lid. He doesn’t agree with this as you can see from his face. About this time I check on the lamb as I don’t want it to overcook. Making the salad is incredibly easy. The veg is chopped so it is nice and chunky. Except for the onions, I don’t like big chunks of raw onion so I do slivers. 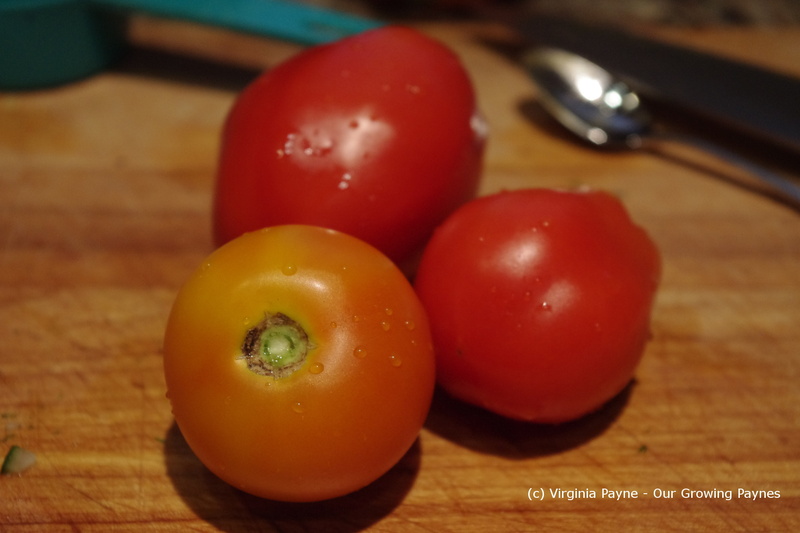 We have a few varieties ripening in the garden for our tomatoes so it makes for great flavour and colour. 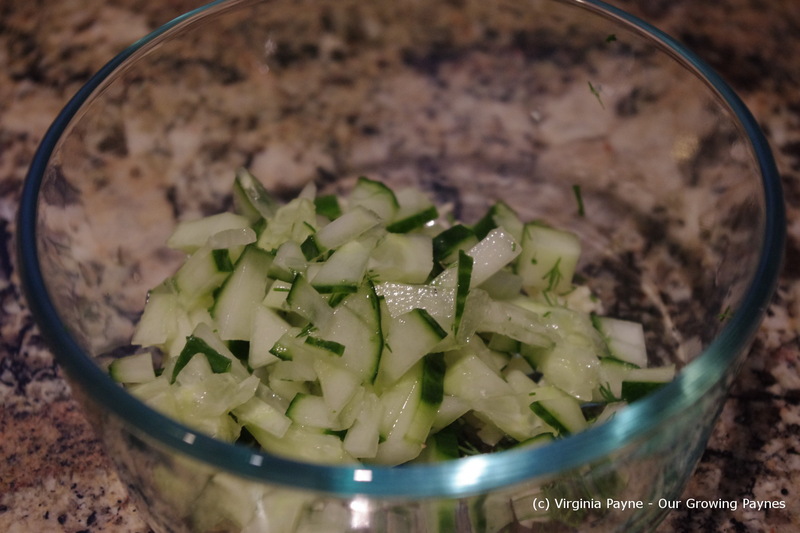 I also chopped cucumber and peppers. I garnished with the feta cheese and kalamata olives. By this time the meat was done and rested and it was time to serve. This entry was posted in recipes and tagged cooking, dinner, food, greek dressing, greek salad, greek salads, lamb, lamb marinade, olive oil, salad, sprig of rosemary, tomatoes, tzatziki. Bookmark the permalink. Thanks. 🙂 It was still a lot of marinade but I didn’t want to run the risk of losing the balance of flavour. Sounds delicious. Greek food certainly suits the current temperatures. It really does and fortunately it is easy to make so it’s more enjoyable in the heat. 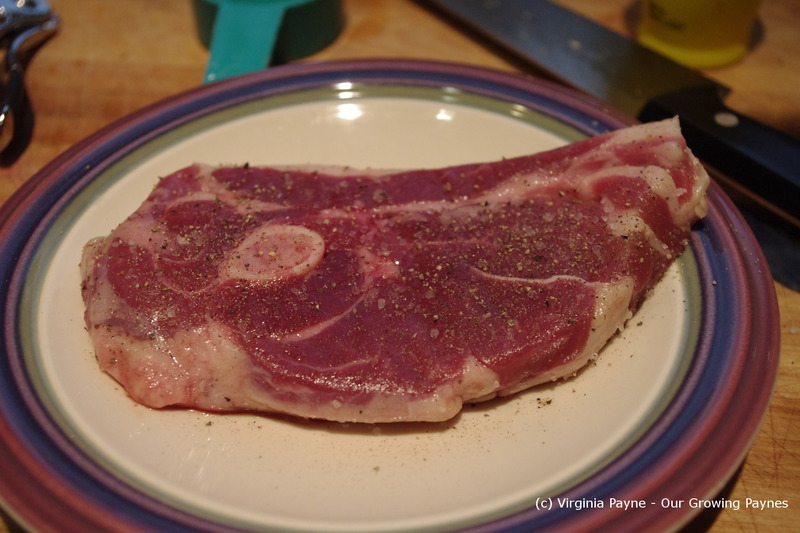 Oh, I wish my husband would eat lamb… This looks so good! The flavours would work with steak as well. For the longest time I wouldn’t eat lamb either. I didn’t like the idea of the cute little animals being harmed. I can now find humanely raised lamb that is local so I feel a bit better about it. Grilled lamb, marinated as you did, makes a fantastic main course. That veggie salad you created looks good, too. I would have been more than happy to dine at your table. This meal must have been delicious. Thanks. 🙂 I love fresh ingredients. 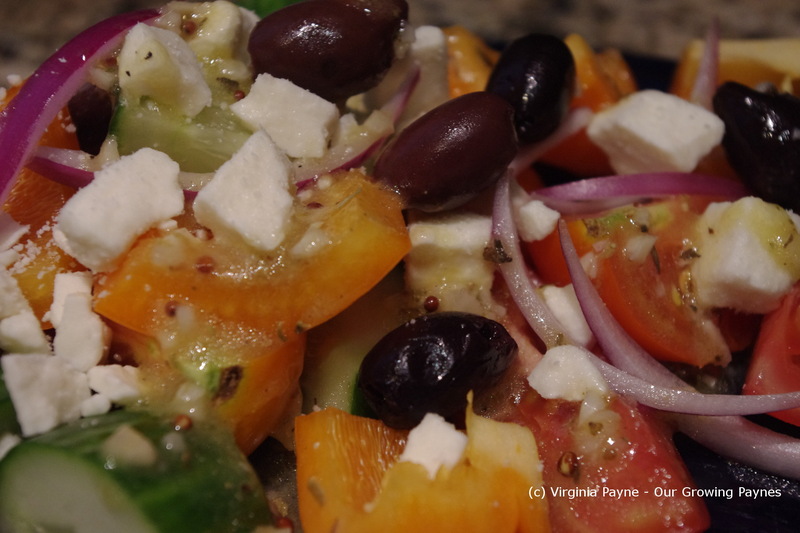 Adore a proper Greek Salad, especially when the tomatoes are so full of sun and warmth, ahhhhh take me there now! Oh and I love your helpers too !